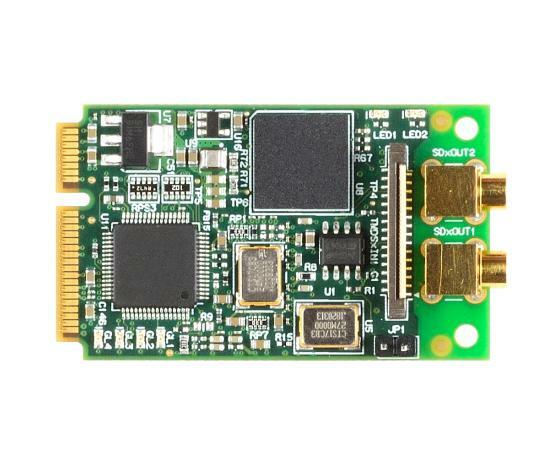 The HDMI2SDI-mini is a HDMI to HD-SDI converter on a miniPCI-express form factor card. The HDMI2SDI automatically converts High definition HDMI to HD-SDI. The compact form factor means the HDMI2SDI is ideal for video conversion in SWaP constrained systems. The HDMISDI-mini takes in the HDMI signaling over a single flat flex connector. The HDMI is converted and output as HD SDI on a 75 Ohm MCX connector. A secondary HD-SDI output is available as an option to allow 2 HD-SDI outputs to be driven. The HDMI2SDI-mini is an intelligent module and requires no user configuration. The HDMI2SDI/mini is powered via the miniPCI-express connector, consuming less than 3.3W.